In the market for a classic car? Not sure which one to buy? 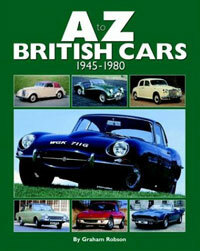 It might be worth checking out the A-Z of British Cars 1945-1980 by Graham Robson, claimed to be the most detailed encyclopaedic study ever produced of all the models of cars produced by British manufacturers in the period. Just over 700 individual models are covered, with full specifications and performance figures are given, along with production numbers and photographs from the archives of the cars and any variations of models. Buy this and you never know – you might find that classic car of your dreams. Available now in hardback for around £20.